Windows 7 | Open Systems Computing Corp. I like Windows 7 and it’s safe to use. There, I said it. Coming from someone who has refused to sell or use a PC with Windows Vista, this is nothing to sneeze at. If you’re buying a new Windows PC, by all means, get it with Windows 7. If you have a Vista PC, run, don’t walk to your computer dealer and order up a Windows 7 Upgrade. If you’re running Windows XP, it’s a tougher call. There is no direct upgrade from XP to Windows 7 and 7 has some hardware requirements that older XP PCs probably won’t meet. If your PC is 2 years old or less, Windows 7 should run, but some hardware upgrades, like adding more memory, might be helpful. Regardless of your computer, if you want to consider an upgrade to Windows 7, there is one thing you must do first: Run the Windows 7 Upgrade Advisor. This is a simple and free download from Microsoft that will check your computer and tell you if it is capable of running Windows 7. 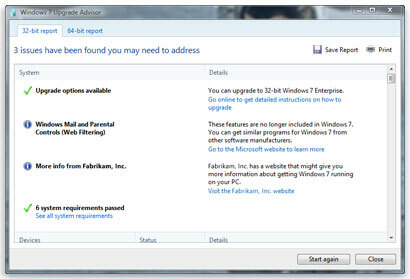 Click here to download the Windows 7 Upgrade Advisor. If your Windows 7 computer is acting up and you can’t determine why, you can easily record everything that you do leading to the problem. When any program starts misbehaving under Windows 7 then simply click Start, type PSR and press Enter, then click Start Record. You can then work through whatever you’re doing that causes the problem and the Problem Steps Recorder will record every click and keystroke, take screen shots, and package everything up into a single zipped MHTML file that can be emailed to a support technician. The technician will be able to see exactly what your are doing that leads up to the problem. This will make the technician’s job much easier, save precious time and most likely save you money, too!